There’s no better way to kick off 2015 than to launch the two newest conveyors in the 3200 Series platform: the Flat Belt and Precision Move conveyors. The release of the next generation 3200 Series Flat Belt and Precision Move Conveyor completes a product line merge that began in summer of 2014. 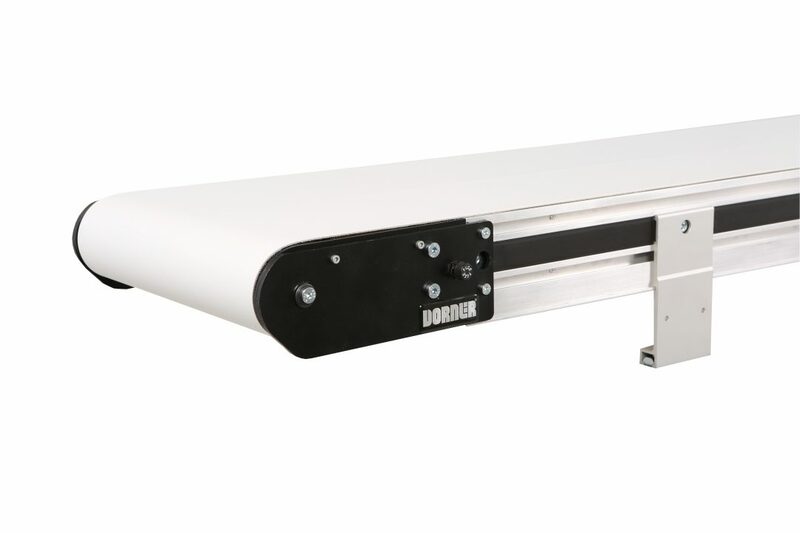 In June, Dorner launched the first phase by releasing the 3200 Series Modular Belt Conveyor. The new 3200 Series product line includes Flat Belt, Modular Belt, and Precision Move conveyors. The goal of the merge was to create one product platform (3200 Series) that brings added flexibility and functionality to industrial applications. The 3200 Series platform is designed to move medium to heavy sized parts, precision applications, bulk handling, and flexible layouts. The 3200 Series Precision Move conveyor platform offers the latest advancements in timing belting and drive technology for low profile belt conveyors. The offering is ideal for the assembly, manufacturing and packaging industries that call for extremely accurate movement of product at specific times, distances and intervals. Precision Move gives specific applications such as machine integration, robotic pick-n-place, precision indexing, accurate part positioning, timed conveying, vision inspection and sheet or wide part handling a new level of functionality and exact product movement. Precision Move includes the timing belt, integrated servo motor and drive, controls and mounting for the gearmotor. It has an accuracy +/- .20”, and comes with belt widths up to 18” wide for maximum flexibility in direct mounting of parts or pallets/pucks. Dorner’s unique attachment method for mounting has an accuracy of +/- .005” between them. This makes the Precision Move offering the ideal automation solution for processes that require accurate alignment of time and distance. For more information on the two newest conveyors in the 3200 Series platform: the Flat Belt and Precision Move conveyors, call 800-397-8664 or visit the product page.